Actress Aïssa Maïga was the first black woman to be nominated for a Cesar, the French equivalent of an Oscar, for the film Bamako in 2006. My Profession Is Not Black is the title of a new book by the French Senegalese actress, who has fought an uphill battle for the last 20 years to show the depth and breadth of womanhood in her poignant portrayals of the Franco-African experience in the European film industry. On Thursday at the Cannes Film Festival, Maïga and the 16 actresses of African descent whose stories are shared in the book, which was edited by Seuil, will hold a history-making forum on the challenges they face as artists in their fight to create an inclusive future for French film. 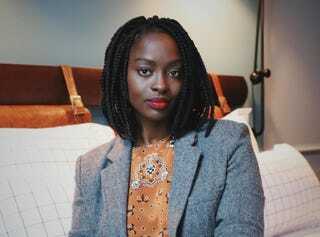 Even as one of the few actresses with access to roles, Maïga—who starred in 2018’s The Boy Who Harnessed the Wind, actor Chiwetel Ejiofor’s directorial debut, and is set to star in Andy Okoroafor’s 20 Pound Dream, which will be shot on location in Nigeria and Hong Kong—sees herself as part of an ensemble effort for equality. “Most of the time when you do see black women in film, they are nannies wearing boubous [traditional African robes] or single mothers with problems and, of course, prostitutes,” she says. As a fan of French cinema, I can attest that this is all too true. Les Intouchables and Divines, two superbly made, award-winning films featuring women of African descent, sadly checked off each one of those boxes when it came to stereotypes. Now is a moment like no other in the history and evolution of black people in the film industry. Black Panther—need I say more? It’s a pleasure to see our French sisters seize the power and momentum of the zeitgeist to speak out as one against racism and sexism to take their rightful place in depicting the wealth and dignity of their contributions to the rich and fascinating fabric of French society.